Hi there! 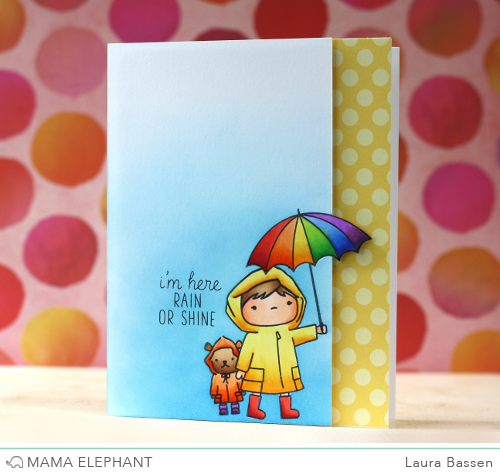 Laura Bassen here and today I have a fun card to share using the new Chance of Rain stamp set. I did some fancy trimming on the right side of the panel leaving just a bit of the umbrella hanging over. Then I popped up the panel over a little polka dot pattern paper. Here's a video to show you how I made my card. Thanks so much for looking. Hope you have a great day! So adorable! 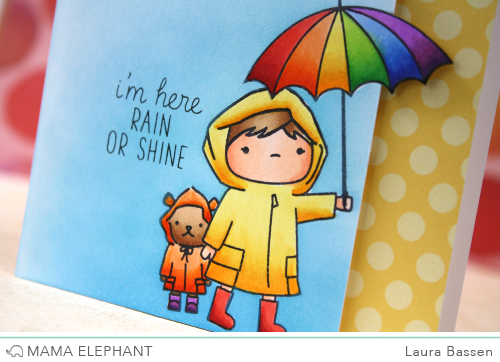 Love that it's colorful & cheery for a rainy day! Love love love! So sweet and still CAS with lots of interest! Laura's card is absolutely adorable! I love her rainbow inspired umbrella...so cute! Adorable seems to be the best word to describe your card... it certainly is adorable! So Cute, Laura B.! Love all of your videos! Thanks! Paulette S.